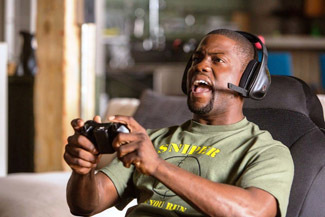 Ride Along, starring comedian Kevin Hart and rapper-turned-bland-actor Ice Cube, is a buddy-cop movie. It stars two unlikely partners who must go do police things; hence, a buddy-cop movie. It’s a tried-and-true form that rarely hits a particularly high mark, but usually entertains — and it’s one of a number of common setups mined when stars, rather than story, are the hook. But — as with other recent entries in the mini-genre, like Cop Out and The Other Guys — the writers (there are at least four, and probably many more at the punch-up phase) couldn’t leave well enough alone. It’s bewildering; if you’re going to rely on an established format, rely on it and go home. There’s no need to overreach, as Ride Along does. Ben (Hart) is an XBox maverick and wannabe cop, freshly admitted to the police academy and nearly engaged to Angela (Tika Sumpter). James (Cube) couldn’t be more of a tough-guy cop archetype if he tried; if somehow you aren’t familiar with this stock character, suffice it to say that he just can’t play by the book. James also happens to be Angela’s brother and only living relative, so Ben is hungry to impress him for reasons both personal and professional. James suggests a take-your-sister’s-presumptive-fiancé-to-work day, hoping to use it to dissuade Ben from most of his intentions. That’s all the story this one needed, being little more than a showcase for Hart. The diminutive comic has developed a fervent following for his stand-up, and shows his physical comedy and knack for endearing self-deprecation throughout Ride Along. Cube remains dry and unfunny, but lends enough of a stern presence to keep Hart’s pinball antics grounded. Like clockwork, Ben bungles assignments but inadvertently sets James on the trail of a drug kingpin, and we can pretty much just surf through to a big explosion and a happy ending from that point. Alas, after all that happens, the plot wrinkles needlessly and we push through another 20 minutes of story development. Who knows why an extra act was necessary in a movie this paint-by-numbers — it may have something to do with an already-greenlit sequel — but you’ll be reaching for your coat long before the credits roll. But the extra weight doesn’t sink the ship, and there are enough laughs for Ride Along to remain afloat. It’s not a classic, but it didn’t aim to be.